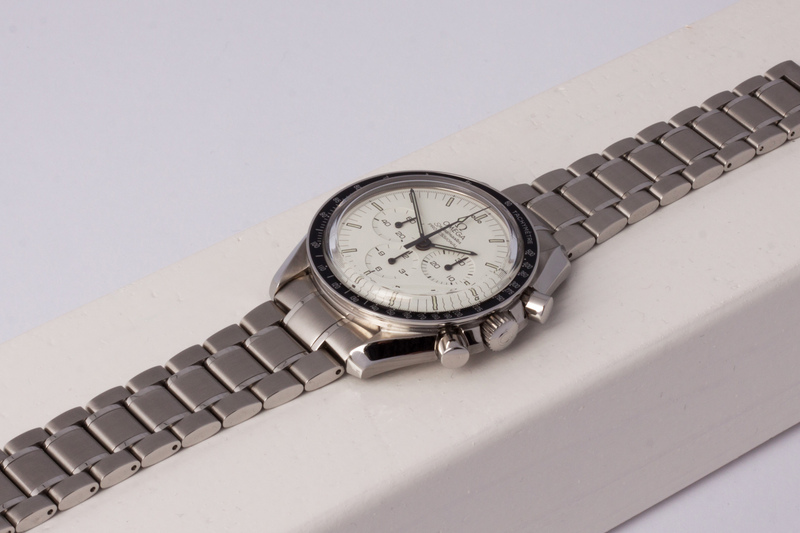 We are very excited to offer you this NOS (New Old Stock) Omega Speedmaster ‘Albino’ manufactured in 1997 by Omega to commemorate the 40th anniversary of the Speedmaster watch! 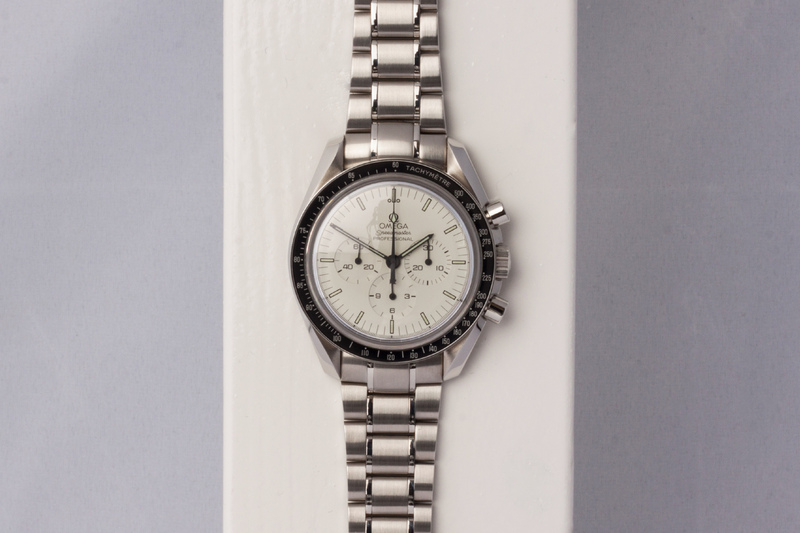 This particular Speedmaster was exclusively produced for the Italian market in a limited run of 500 pieces. 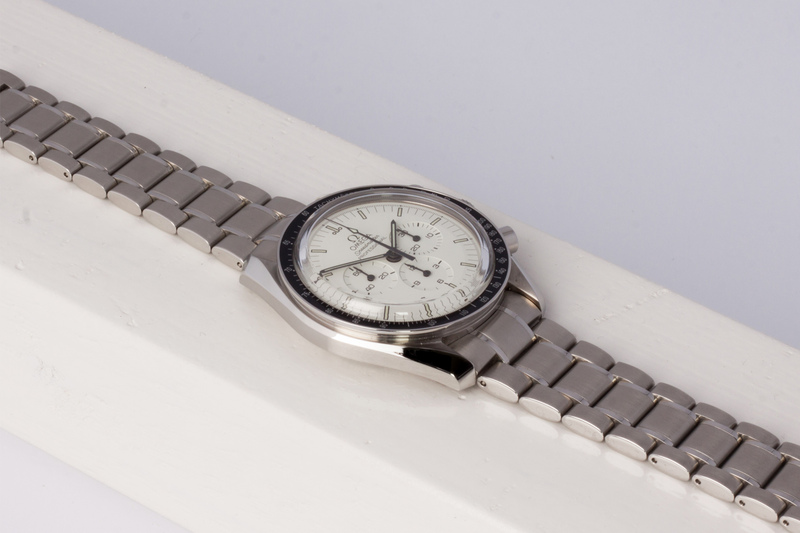 There were two types of references made; the 35932000 which is the ‘Albino’ Speedmaster as seen on our photo’s on a stainless steel bracelet, and reference 38932000 for the one on a black leather strap with Omega folding clasp. The Albino Speedmaster is special because of a few several Omega facts, sure it is a limited edition and has an off-white/creamy dial. But did you also know there were a lot of ‘firsts’ with this particulair model. It was the first Speedmaster to feature a sapphire crystal, it was the first speedmaster to feature sapphire crystal not only on the top, but also on the bottom – on the caseback (the so called sapphire sandwich). It was the first Speedmaster with caliber 1863, this caliber was decorated with a Cotes de Geneve finish and was rhodium plated to make it more appealing through the sapphire caseback. And last but not least, this Speedmaster was the first to have Super-Luminova on the dials and hands for increased readability in low light and dark conditions (instead of Tritium). Now, when is a watch NOS? 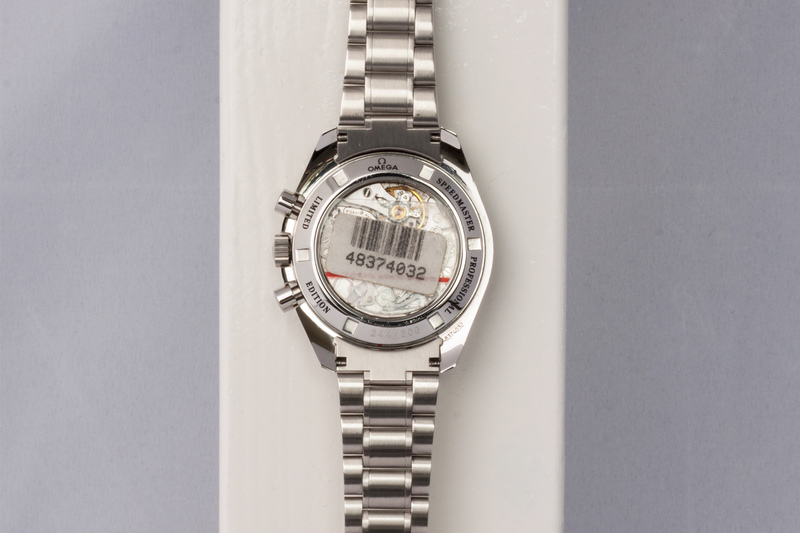 In our opinion a watch is truly NOS when it hasn’t been worn, shows no signs of wear or damage and still has the Original factory finish on the case and bracelet, A perfect NOS find would be one with all stickers on the watch still intact, and with the original box and papers. Most authorized dealers removed the stickers for display purposes and we all know what happens(ed) with watch-boxes all to often… Nevertheless, our Albino is still partially in the stickers! 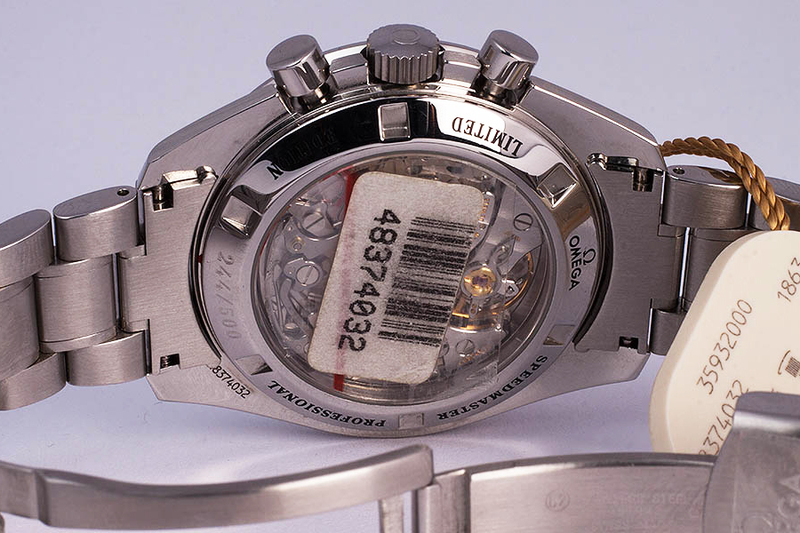 The caseback still has the factory sticker with (factory) barcode and casenumber on it, this casenumber matches with the one on the case itself, and with the numbers on the warranty card and hanghtag. There are no scratches or any other damages on the case and bracelet and the finish on the entire watch is the original! There’s a sticker on the top crystal and the folding clasp in also partially stickered. The small red laquer seal, which Omega uses to seal all brand new factory casebacks, is still in place and unharmed.. truly NOS and one hell of a find! The Albino Speedmaster has a wondeful off-white creamy dial, if you compare it side by side with the latest white dialed Speedmaster Silver Snoopy edition, you will know exactly what we mean. The Snoopy, and for instance The Alaska Project Speedmaster, have bright white dials, so this off-white cream dialed Speedmaster is really something else! 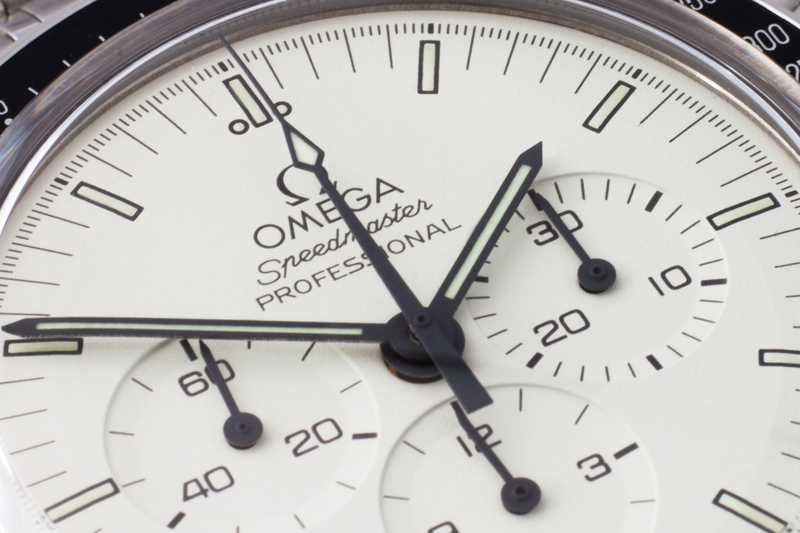 You will not find this dial color in any other Speedmaster watch! As mentioned earlier, the caseback is still sealed with the red laquar so we didn’t open it. Instead, we checked the timestamp of the movement on our Witschi machine and she was a little slow. Nothing suprising there as the watch spent the last twenty years inside a cabinet doing nothing… as these watches are becoming more of an investment we like to leave it up to the buyer on what to do when it comes to a movement service. WatchWorks Haarlem will still provide you with a twelve month warranty on the Albino and if desired by you, our client – we will have the watch fully serviced by Omega, the choice is yours! box and papers: Yes! white outer Omega box, black leather inner Omega box, warranty card, hangtag and booklets – Including the Extract From The Omega Archives).